I was diagnosed with breast cancer in January 2012. 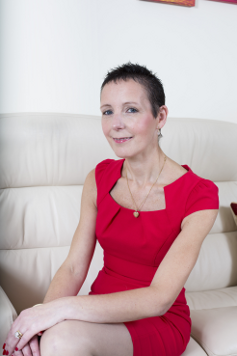 My consultant surgeon (Mr K) told me that I would need a mastectomy, chemotherapy and radiotherapy. This was a huge shock. However, Mr K talked to me about what the scar would look like and showed me photos of how you might look, dear body. Initially after surgery I felt very self-conscious, and would not undress in front of my husband. He realised what I was doing and had the courage to tell me that it didn’t matter to him. After 22 years of marriage and busy lives we didn’t always acknowledge how much we loved each other. We now realise that we should cherish each day, and our relationship has strengthened as a result. You are a slim body and after surgery I changed how I dressed you, wearing baggy clothes rather than fitted clothes so that I didn’t hurt your scar and to avoid people seeing that you were deformed. Your scar is still tender so I avoid my prosthesis and have continued to mostly wear baggy clothes. I remained mostly positive during treatment even though it was difficult when your hair came out in handfuls, you lost your body hair, and your nails started to break and lift. My husband encouraged me to help you look good by wearing a great wig and having a regular manicure with gel nails. Your hair started to grow back about two months after chemo had finished. It was great to see it growing but when I realised it was coming back grey I was very upset. I took the plunge and created a new look for you, colouring your hair and spiking it, and I received many genuine compliments. Hormone changes made you grow excessive facial hair, and heavy makeup wouldn’t hide it. I had laser treatment to remove it, and I now have my confidence back. I have always liked to keep you fit and throughout treatment I exercised regularly. My husband and I would go for long walks or to the gym at the right times in my chemo cycle. This helped me keep in good health, maintain a positive attitude, cope with the side effects better, and have quality time with my husband. At the gym I avoid changing in public and showing the upper part of you, dear body. I am growing my confidence and will now drape a towel over my shoulders to cover my chest when I dress in the communal area. I do this as I think it would upset and embarrass others to see you and your scar. I had no idea what a body looked like after a mastectomy and know that many others have no idea too. I am proud of your short hair and that it is symbolic of surviving cancer. Dear body, now I want to feel not embarrassed about your scar, but proud of it.